HouseValues was started in 1999 by Mark Powell who was a second generation real estate agent in Seattle, WA. Mark had worked for ValPak before entering real estate and had a strong understanding of direct response marketing, particularly among local businesses. As a real estate agent, Mark took out a number of small ads in the Seattle Times offering consumers a free home evaluation. The ads generated leads for Mark in his target markets of Bellevue, but he also got a number of consumer inquiries throughout the greater Seattle-Tacoma market, areas that Mark did not work (like Tacoma or Everett). Mark referred the leads he did not want to other real estate agents and collected the standard 25-35% referral fee on closed deals. The more Mark advertised, the more “out of area” leads he generated. Mark knew that there was a bigger business opportunity here. Mark incorporated the business and raised a small angel round before finally landing Second Avenue Partners as the first institutional capital for HouseValues. Nick Hanauer and Pete Higgins immediately liked the business opportunity. The key to success for HouseValues was bringing down the cost per lead. Refer to the chart below for the evolution of the HouseValues media mix, which I assume is very similar to other traditional and online companies. The company started using print to generate its leads, but there was a bigger opportunity to scale the consumer marketing. In late 2000 / early 2001, Mark hired Bob Schultze to manage the media buys. Bob is an experienced long and short form TV media buyer, working on campaigns such as the George Foreman Grill and the Juice Man. Based on Bob’s TV experience in local media and local broadcast relationships, Bob was able to reduce the cost per lead by 2/3rds, immediately making the business model profitable. At this point, HouseValues started rolling the business plan out aggressively across the country and limited the amount of capital that was needed to fund the company. The next step in the evolution came in 2002 when HouseValues was national in nearly 220 markets buying local boardcast in most of the markets. At this point, we started to test cable television. Cable again dropped our cost per lead significantly such that we were able to scale back on our local broadcast spend and aggressively grow our cable spend. Finally in late 2002, after numerous tests with banner advertising, HouseValues tested search. Search was able to drop the cost per lead significantly again. Search generated results at 60% of the cost of cable television and about 25% of the cost of local television. Banner advertising was largely comparable with cable television. 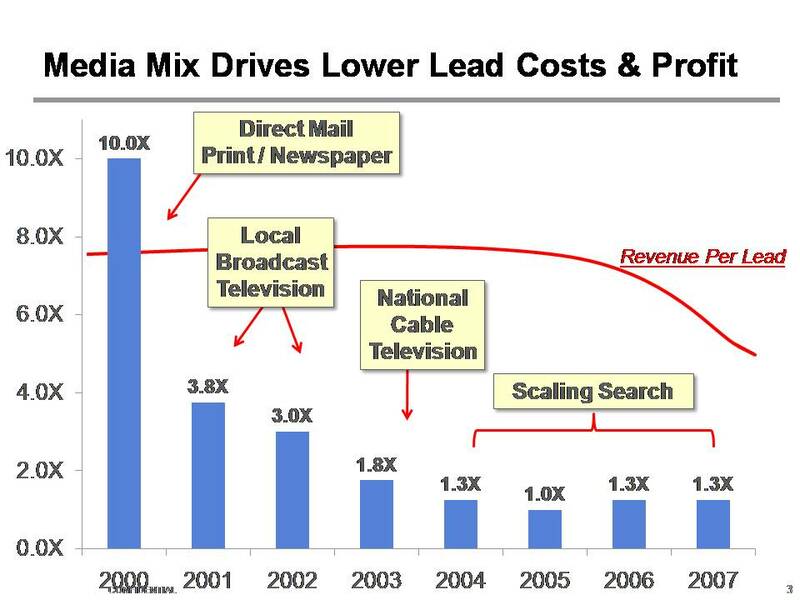 The below chart covers the evolution of the HouseValues media mix for its primary products and the cost improvements that the business saw transitioning from media to media. Of course, with each media form, we saw volume limitations and it was important to maintain a mix and constantly both the volumes and price points by product. We will talk more about the local media mix, volume, and price points.